We selected the basic model, because we were not sure how frequently we would use it (as opposed to our MSR stove). 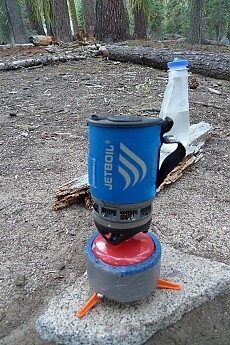 Well, we love the JetBoil, and use it much more than the other backpacking stove. 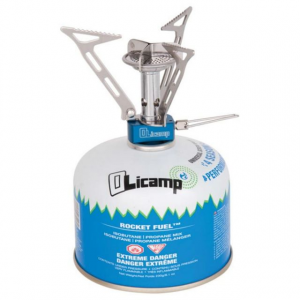 We use it for making hot drinks while snowshoeing or hiking, for making quick meals while canoeing and canoe camping...it is easy to use, the canisters last a decent length of time, and it is very efficient at boiling water. 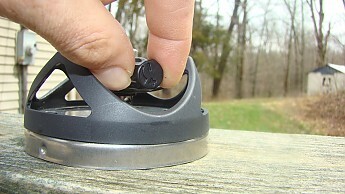 The stove is quick and easy to set up. We do not have the built in igniter, so we have to use matches or a lighter...but this has not been a big issue. The thumb adjuster works well, though as we usually are just boiling water, it is mostly on high. We have not tried any other type pans with it..the flame is pretty localized, and not sure it would diffuse hat without additional gear. 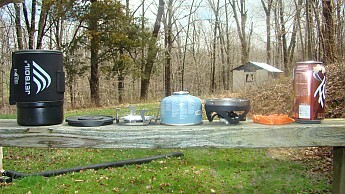 The stove seems very stable, as we have set it up on sand, rocks, logs, and snow. We have recommended this stove to others. The Jetboil Zip is a great choice for anyone wanting an affordable and highly effective personal cooking system that works well on overnights and thru-hikes alike. Don’t let that hiker appetite slow you down, use the Zip and your hunger will be gone in a jiff! Not easy to cook on "low" or "smmer"
I put this system to the test with several overnight and weekend trips before finally taking it on a section hike of the AT. The first 1,000 miles NOBO and I had the Zip with me every step of the way. I used it to boil water and cook different types of food. I used it as a cup, a bowl, a water collection device, and once, I tried to use it as a pillow. After spending so much time with the Zip I feel I can offer some great advice to anyone considering buying it. 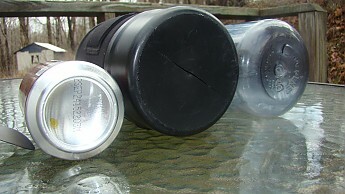 When I purchased my Zip it came with the 0.8 liter aluminum pot with the neoprene cozy, stainless steel burner assembly, canister tripod, plastic bottom cover and the rubber lid. I purchased it from a large name outdoor retailer for around $80 a couple of years ago. I should note before we go any further that I am the type of person who meticulously maintains their gear. I am very careful with all my gear when using it, packing it and maintaining it. I always clean every item after every trip. I make sure to keep my gear stored safely to avoid any damage when at home and while on the trail. I am a bit OCD with my gear and might take a few more steps than others to ensure that it lasts me a long time. 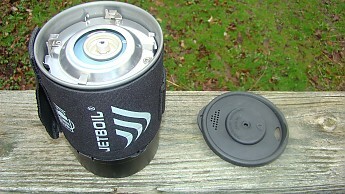 The Specs: According to the Jetboil website the weight is 12 ounces, height is 6.5 inches, width is 4.1 inches and the volume is 0.8 liter. 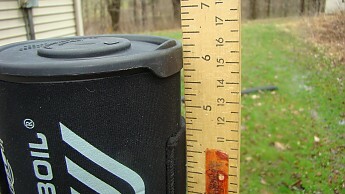 Using the same items as the folks at Jetboil I busted out my scale to check their accuracy. I was able to get a weight of 12.85 ounces. Not a huge difference. Add my 100g fuel canister at 6.1 ounces and it brings the total for everything to 18.95 ounces. 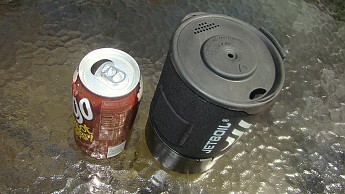 It boils 0.5 liters (16 ounces) of water in 2 minutes and 30 seconds. The measurements are close enough to accurate. 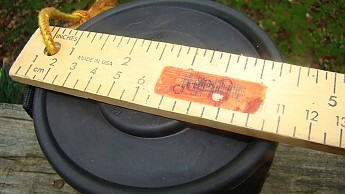 I have done my best to take some photos that show the measurements and also include some familiar items for scale. I will include all of my photos at the bottom of this review. 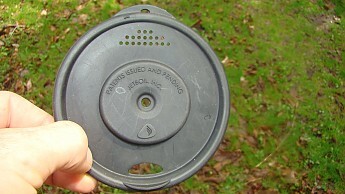 The Lid: Made of a flexible rubber it is a drink through lid with a pour spout and strainer. 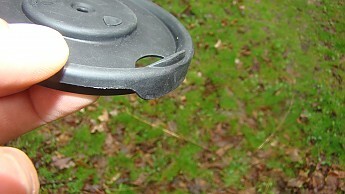 Fits securely to the pot and keeps all the items nested inside the pot secure. I never really used the lid to drink through, although I am sure it works fine. I just drank straight from the cup. I did use the strainer to strain the water from my mac-n-cheese and it worked great. Don’t attempt to turn it upside down without keeping at least one finger on the lid to prevent it from popping off. 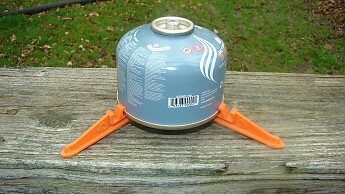 The Pot: A 0.8 liter aluminum cooking pot which stores the burner, 100 gram fuel canister (will not hold any other size fuel canisters), and the tripod fuel canister stabilizer. 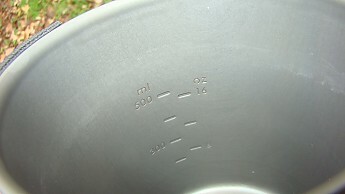 The inside of the pot has measurement marks. 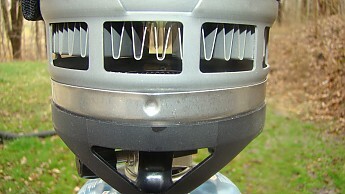 It uses Jetboil’s patented Flux Ring technology. 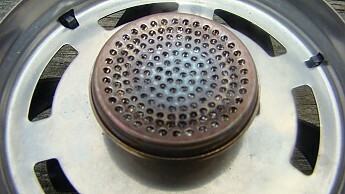 Basically, metal fins on the bottom of the pot are used to evenly disperse the heat from the burner. The pot also has 2 cutouts on the side of the bottom to allow it to attach to the burner assembly and then be rotated to lock the pot to the burner. The pot is great and I was able to cook in it and eat directly out of it with my long handled spoon. I cooked stuffing, noodles, mac-n-cheese, and other foods in it without a problem. Can be a bit tough to get your hand in for cleaning, I keep a quarter piece of a sponge in the pot for cleaning and get a new one every so often. I have never let anything burn in the bottom so I cannot speak on that. Just keep an eye on it because it cooks wicked fast!!!! The Cozy: Available in Carbon or Sapphire, the pot Cozy is a neoprene cover that comes included when you purchase the Zip. Sleeved on the side to allow your hand to slide through and make holding the pot easier and safer. 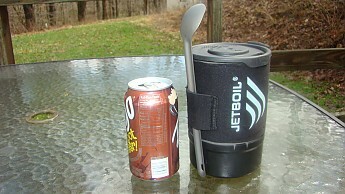 The cozy also includes a tunnel pocket which can be used to hold a utensil or, it can be used with the hanging kit that Jetboil offers. It works well at insulating your hand from the boiling liquid inside. Watch how far down the cup you have it while cooking. Saw a guy melt his because he had it pulled down too far. The Burner: A stainless steel burner with a black plastic rotary knob. It has two BB sized indentions along the top flange, on opposite sides that work in conjunction with the 2 cutouts on the pot to secure the burner and pot together. It can be a pain sometimes trying to rotate the pot on and off of the burner. I usually just set the pot on the burner without turning the pot to lock it to the burner. Works good for me like that. The black rotary knob that is used to control the fuel flow is my biggest complaint with the Zip. The knob is slightly recessed underneath the burner making difficult to grab. If the pot begins to boil over it can be impossible to get to it without getting burned. Just keep a close eye on it while heating or cooking. The burner is described as adjustable on the zip but I find it to be difficult to get it to stay at a low or a “simmer” setting. 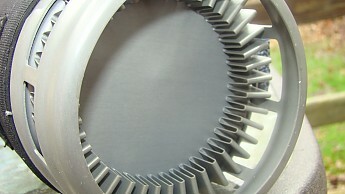 It is possible to get it to stay on a lower output, but difficult. 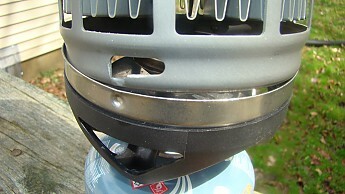 Also, the burner does not come with a built in piezo ignitor like other Jetboil models. This may be a deal breaker for some but for me it was just 1 less thing that could fail. I saw a few of them stop working while hiking the AT. I keep a small bic lighter inside my pot with the burner. 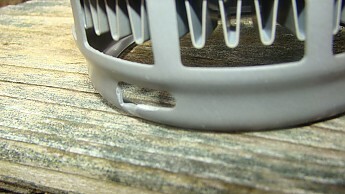 The wind can cause the burner some trouble. I found difficulty with it heating only once. I was in the middle of the Smoky Mountains on the AT. I cannot be certain but I would say it was gusting wind into the 40’s. I just stepped inside the shelter for the 2 minutes it took to boil the water. With the conditions that day everyone was having that issue, no matter what setup they had. 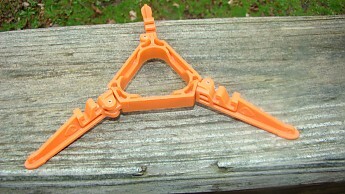 The Tripod Fuel Canister Stabilizer: Made of a bright orange plastic the stabilizer has 3 legs that fold in allowing it to be stored inside of the pot with the other items. 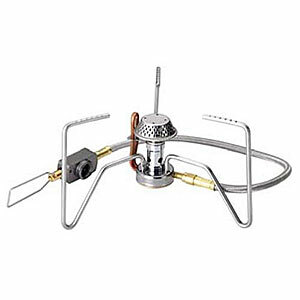 It can add a great amount of stability to both the small and large fuel canisters and your overall cooking system setup. I actually did not use this that much. Most of the time I was on a smooth level surface and did not have the need for it. Even with the small fuel canisters. I mostly used it when sitting it directly on the ground and when I could not find a really level spot. The Bottom Cover/Cup: I was not sure what to actually call this. Is it a cover, a cup, a measuring device or just a pain in my...you know!? I would have to say all of the above. My intentions were to use the thing for drinking out of at meal times. I don’t think that I made it on more than two overnight trips before the bottom of it cracked while I had it in the pack, rendering it useless for what I was wanting to do with it. Yet, I still keep it. My OCD will not allow me to get rid of it. 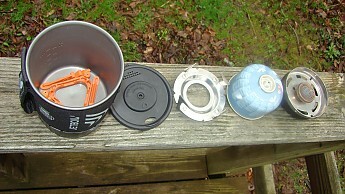 I have actually started using an MSR bowl that I scored from a hiker box at Fontana Dam. It is almost the exact same size and it fits perfectly over the bottom of the cup. Made from much more durable material, but I could honestly do without it if I had to. 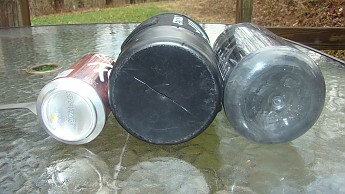 The Fuel- A propane/isobutane canister fuel that is offered in a 100 gram and 230 gram canister. 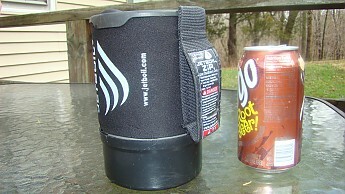 The 100g canister is the only one that will fit inside of the zip with the burner and stabilizer. I have not had any issues with cold weather with this fuel. 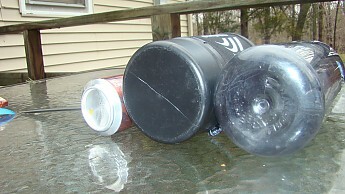 I set a canister in the snow and ice for 3 hours. It did not seem to burn any differently. I have never been consistent enough with my usage to tell you how much use you can get out of a single canister. But I feel that it is a substantial amount. I usually use it 2-3 times in the morning and 3-4 times at night. I can go a few days like that. 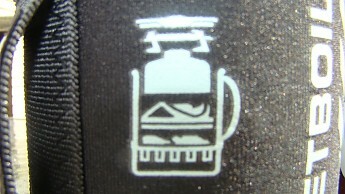 The Zip is the cheapest model that Jetboil offers. This is because it does not have the extras that some of the other models come with. 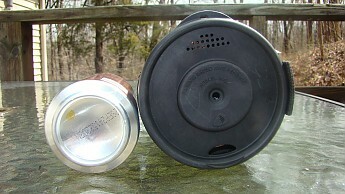 Like the piezo ignitor, larger cup capacity, color changing heat indicating cozy and a different valve adjuster that has a wire lancet instead of the plastic rotary knob. Newer models that Jetboil offer come with and updated burner that is supposed to better regulate the fuel flow allowing for a wider more accurate range of settings making cooking and simmering easier. 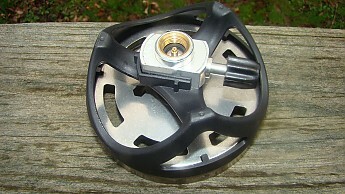 Other models include the Flash, Joule, Sumo, MiniMo, and the Sol which is available in titanium or aluminum. All the models offer different size pots and have options for the cozy colors. All the pots and burners are designed to be interchangeable amongst the different models and most of the accessories can be used with all of the models as well. 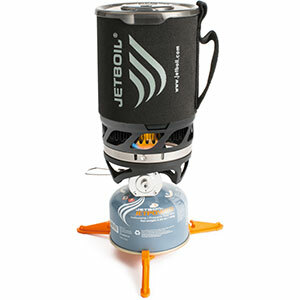 Jetboil also offers a wide range of accessories such as a hanging kit, coffee press, utensil kit, pot support, and a frying pan with flux ring technology. I continue to use my Zip to this day. It has proven to be durable, versatile and reliable. I have cooked food in it with no problem. You just have to stir constantly, and sometimes turn the burner off for a few, then back on to finish cooking. No matter what you do with the Zip it is going to do it FAST! So don’t leave it unattended and be ready to shut it off. I would recommend the Zip to anyone who goes camping. It is great for everyday use or the occasional overnight. So I hope that this helps you when the time comes to make your next cooking system purchase. 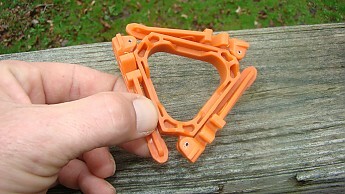 Thanks for sharing your helpful Zip review, Chris, as well as all of the pictures! Great review! you mention how meticulous you are about cleaning and preserving your gear and it shows in the pictures! Assuming that's the same stove you've been using in all your travels, it looks awesome! A fast and lightweight cook system, when all you want is hot water in a hurry. 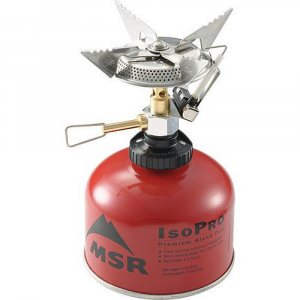 My old MSR Superfly stove has given me great service for over ten years. 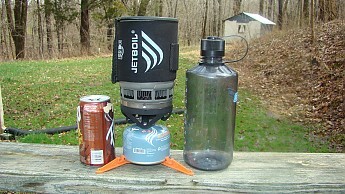 But I've been wanting to try a Jetboil system for some time, and with plethora of REI gift cards in hand, I went for it. 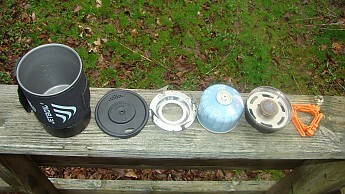 The setup of the stove is simple. Just screw the cooker on to the canister, fill the cup with water, light burner, attach the cup, and you're good to go. The burner is easy to light, and I don't miss having a built-in igniter (which tend to stop working after a time anyway). Flame control is acceptable for this type of stove, though it would probably be difficult to get the flame low enough to "simmer" anything. The speed with which this thing boils is fantastic. I found that it took sometimes less than two minutes to boil a full cup (.8 liter capacity) of water. (Keep an eye on it... if it's pretty full and boils hard, it can spit hot water, and make it difficult to reach the knob to shut it off.) 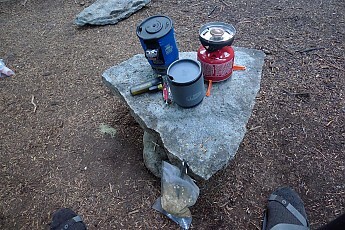 In a week of backpacking at Mt Rainier, I used a 100 gram canister for the whole trip (doing 2-3 boils most days). Wind didn't seem to effect its performance at all. The whole thing is very stable, and I was never afraid it was going to fall over. The system packs down very quickly and easily, and takes up very little room in the pack. The only complaint I have is, that sometimes, after the water is hot and gas shut off, the cup can be challenging to twist off. I found that I had to be careful not to burn my fingers on the hot metal parts trying to do it. Overall, I love this thing. It is perfect for the kind of trail cooking which I do, which is simple and fast, and I expect to get many years of use from it. Thanks for the review, David. 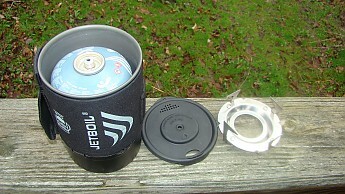 I hope you'll keep us posted on how your Jetboil continues to perform. Great cooking system that burns fuel efficiently and cooks food quickly! It is self-contained and light, making it perfect for any backpacker or hiker. 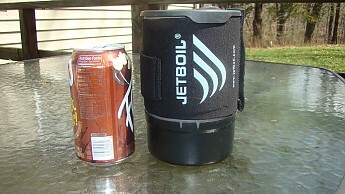 Jetboil. That's a word a lot of backpackers hear, and I'm here to tell you more about it! 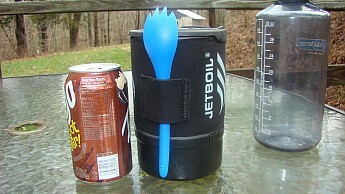 There's a bit of skepticism around Jetboil, but I would like to help debunk that. I bought this for the start of the summer, and haven't had any problems with it. My justification for its price is the amount of money I save in fuel. It boils water in just over two minutes opposed to the eight minutes it takes to boil water with other systems. I am also a guilty aesthetic lover, and it looks really cool! I cook all of my meals with this fancy piece of gear, and occasionally use it to make pine-needle tea in the backcountry. It boils my water quickly which gives me lots of extra time to put on bug spray when I'm getting eaten alive, and I am confident in its construction. If I were to kick it over while smacking off mosquitoes I wouldn't worry about damaging the system. As a backpacker, I look for the lightest and highest quality gear for my pack, and this definitely fits the bill. Some may consider this too heavy as a cook system, but its compromise is its efficiency. 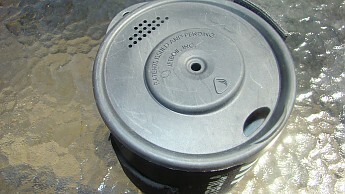 It has something called a heat-sink on the underside of the cook pot. This amazing invention is a coil of metal that absorbs residual heat that would normally escape out of the sides of the burner, and puts it straight into the pot. 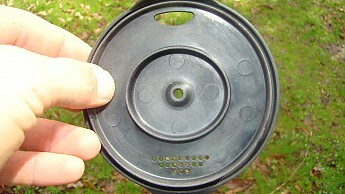 This allows for a quicker boil time and doubles as a great windscreen! 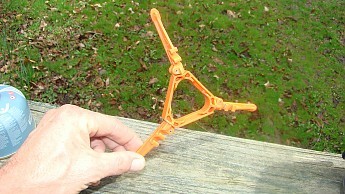 I frequently use it in heavy winds and it has yet to blow out. All of the accessories fit into the pot, which is really nice when it comes to spacial awareness. It is also easy and fast to put together. The fuel canister support mechanism is a nice feature of the Jetboil, and it greatly improves the stability of the system. I would like to mention that it is a bit of a tight fit on non-Jetboil brand fuel canisters, but it will go on with some practice. When it comes to simmering, it is difficult, but possible. With a light touch, simmering can be achieved, but sometimes I turn the knob too far and put the fire out. A lot of people argue that simmering is impossible, but I strongly disagree. 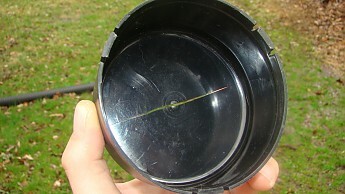 I have also used this system everywhere from 6,000 to 14,000 feet and it performs similarly in all environments. Obviously if the fuel canister is cold the fuel comes out slower, but if you cuddle with the fuel while you sleep, breakfast is an easy feat! I recommend this system to any outdoorsman that is looking for an efficient, stylish, and high-quality cook set. It's price is a bit steep, but for what you receive it is well worth the investment. If you take care of it, it will last you your whole life! Thanks for the review of your Jetboil, William. Kookpot houder er niet standard bij!! Waardeloos dat er geen pot houder bij zit voor dat geld. Na koken water krijg je de kop er niet af!! omdat hij uitzet en zich vast zet. Great for boiling water only. 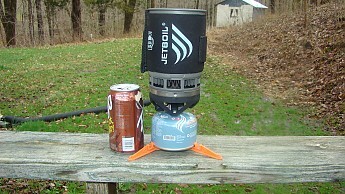 I have purchased several JetBoil stoves. Works great to boil water. The igniter doesn't work at all though. Also, never buy the JetBoil pan. It is very expensive and not coated and everything sticks to it. I used it once and it took me several days of soaking and scrubbing to get the eggs off. Extreme portability and fast burn rate. If all you're after is a very portable high quality stove to produce a warm nourishing hot drink in under three minutes, then the Zip is a must-have purchase. I have tried cooking on my stove, and though it's not as versatile as more cooking designed stoves, it will still produce a good meal in an acceptable time rate. Remember your last walk or trip in freezing temperatures, and your core temperature was crying out for a hot drink or packet soup, to revive your spirits? Setup of stove to boil, in under five minutes, and that lovely warm glow returns, oh that cup of boiling hot tea or coffee was a Godsend. If all you're after is a warm drink to revive your flagging spirits, the Jetboil is a clear winner, with no negative aspects surrounding its construction. If your only requirement is a very high quality and very portable stove, to produce a boiling hot pick-me-up drink, in less than four minutes, then the basic Zip Stove is a clear winner. Very well designed, with the entire stove and accessories fitting snuggly inside the main water canister, the Zip was never intended as an out and out cooking appliance. Its main function was to boil water from normal temperature to boiling point, in a little over three minutes, and there must be countless number of pre-prepared meals that one can purchase that only require hot water to prepare. The Zip being the basic stove, does not come with a pre-ignition in built lighter for the gas, you must use a box of matches or lighter, but that is not much hardship now days. If you require more than just a portable kettle, then the more technical Jetboil stoves will be on your list, but if it's just a very high quality stove intended simply for boiling water, the Jetboil Zip is magnificent in its task. A solid choice for camping and backpacking but lacks some versatility. Very simple to use. Would recommend it depending on what a person wants out of a cook system. Can't always find fuel for the stove. This cook system has been very easy to use. The flame is consistent every time and as a whole the system is very reliable. Makes cooking in the backcountry really easy because boiling water is very fast. The only downside I see is in its versatility. 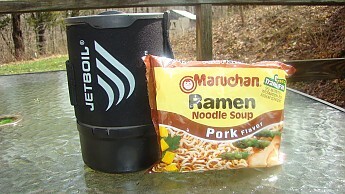 The Jetboil works best for boiling water, but not a whole lot of other things. Also, I haven't tried cooking with non-Jetboil pots or pans, but I don't know how well that will work. 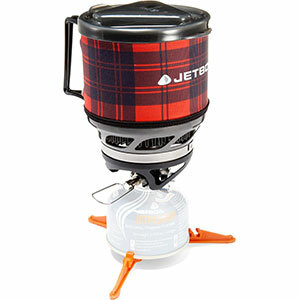 Jetboil has specifically designed cookware to go along with the stoves. 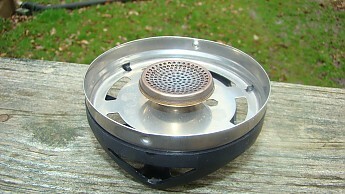 Also fuel for the system may not always be available where alcohol may be more readily available for an alcohol stove. Overall, I think it depends on what you are looking for in a stove. I like this system if I simply want a no-fuss cook system, but if I wanted to get a little more creativity I would go with a different system. Great stove. Heats water really fast and uses very little fuel. Used it camping and had no problems. Setup is really easy with only three parts. Very sturdy. But you're limited to the pot it comes with, otherwise it get unstable. Boils water in about a min. Everything packs into the pot for easy storage. This product is very light, compact, and reliable. This product is very light, compact, and reliable. 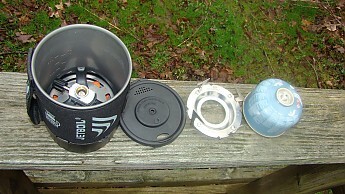 I've tried MSR PocketRocket and mini blue torch alcohol stove, but the Jetboil is way more efficient. Built-in wind screen and boils within half the time. 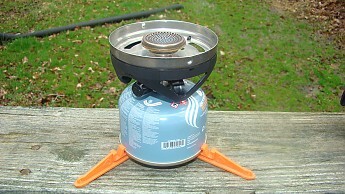 I've owned several stoves, first one being an MSR PocketRocket. 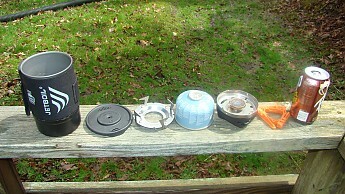 The next being a lightweight blue torch alcohol stove. 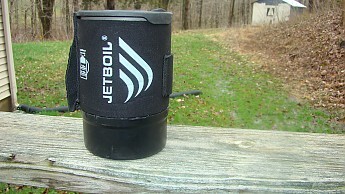 But for efficiency, ease of carry, and everyday usage in all conditions nothing compares to Jetboil Zip. Great all-in-one camp system. Best for elevations under 8000ft. I would absolutely recommend this product. Not a single problem from day one. I have been using the Zip for two years now for backpacking and yet have had a single issue. It does boil water slower at elevations higher than 8000 ft, but still super happy with my purchase. Great for solo trips, and smaller portions of food. 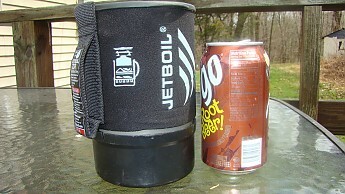 Smallest in Jetboil lineup. Setup is very fast and easy. The Zip doesn't have a built-in igniter, larger models do. Boil time is only a couple min. and the flame has yet to be blown out, but if it was windy I always put it behind some sort of windscreen(not included). It is very stable and also comes with legs for the fuel canister. 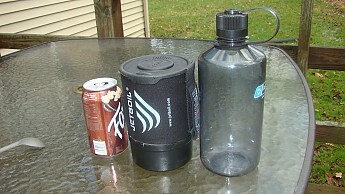 IT packs down to the size of a Nalgene bottle. 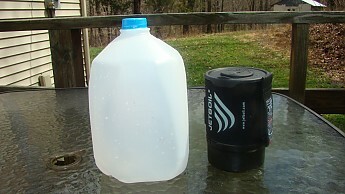 If you buy the small canister of fuel it fit inside of the Jetboil. I just purchased the French Press adaptor and am very pleased with it. (Only after learning the tricks to it.) So to say I am happy with it would be an understatement. Go out and get one! I chose the Zip because it's barely heavier than the Sol Ti but a whole lot less expensive, and I got it on sale. And I'm glad I did. It packs very nicely, and fits well in my pack. And that's saying a lot, since I now primarily use a 35L backpack. Boil times are amazing, and when I moved my hands over the pot and down the sides, I could tell why: virtually all the heat was focused on the bottom of the pot. This also makes it very fuel-efficient. The downside is directly related to that. This stove boils water really really well -- which is all I need it to do. If you want to cook in it, be prepared to watch it carefully and stir it a lot. All the heat of the stove is focused in a very small area at the bottom of the pot.